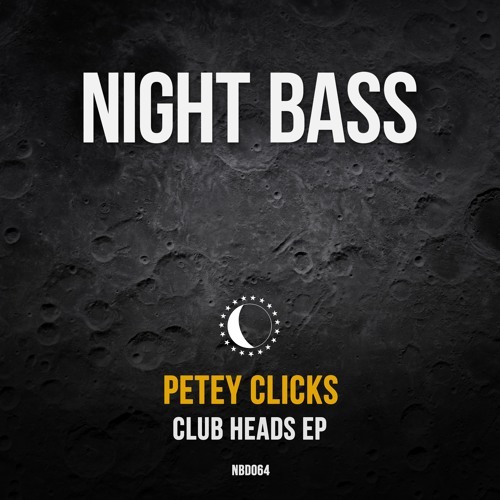 Stream / Download: http://smarturl.it/NBD064 Night Bass on Spotify: http://bit.ly/NightBassPlaylist @Petey-Clicks is one of the most original artists out there today, pushing his sound further and further into pure originality with each release. His 5th solo Night Bass EP opens with a one-two punch starting off on “Parred”, the incredibly frantic and high-energy peak time smasher, followed by the equally powerful “Bass n Tweeters”. Third on the EP is the title track “Club Heads”, filled with call and response bassline madness. And rounding out the EP is “Paid”, which steps into techno crossover territory with it’s loopy riff and bass-heavy kick drum.